The cold wind blew past the geese with the weight of a freight train and the sting of a hundred bumble bees. It was a strong reminder of why they were migrating south for the winter. As the geese did their final stretches in preparation for the long flight that lay ahead, Ralph, the flock’s flight commander, proceeded to do a final roll call. "Alright, Troop 408, you know the drill - it’s time to get underway. When I call out your name, a simple yes, or here, will suffice." As Ralph went down the list alphabetically on his clipboard, he dreaded reaching the letter C. Every year Ralph’s younger brother Carl pleaded to lead the flock. And after years of nagging, Carl had finally been given the chance to lead the troop a few years before. It was one of the worst decisions the flock had ever made. "Come on, Ralph. You’re never going to let me live that down," said Carl. "Carl, you were supposed to fly to Florida. Instead, we spent the winter in Albuquerque." "Alright, so I got a little off track. Why didn’t anyone say anything?" "Oh believe me, we all wanted to," said Ralph. "The moment you made that sharp turn past Louisville, well, everyone knew then we were in big trouble. But the flock agreed to honor the code of silence." "The code of what?" asked Carl. "You’ve got to be kidding. Surely you haven’t forgotten one of our most sacred pacts, Carl," said Ralph. "Of course I haven’t. A nest must be guarded at all times." "The other one, Carl," said Ralph. "I have no idea what you’re talking about." "Carl, the code of silence is an agreement that a flock honors when following one goose. The moment a leader is selected everyone agrees to follow them no matter what. From rooftops, to telephone wires, to circling in the air when you feel like your wings are going to snap, it doesn’t matter - you follow the leader. You don’t question them or their flight plan. You seem to forget, but that’s why we followed you all the way to Albuquerque." "Okay, so one little mistake and I am forever banned from leading the flock again. That’s not fair, Ralph." Ralph slowly waved his clipboard in front of Carl and asked him to name its color. "Nice try, Ralph. That’s a trick question. There is no clipboard," said Carl. Ralph leaned in toward Carl, and gently tapped the clipboard against his beak. "Carl, please get glasses like we discussed. One of these days you’re going to fly right into a building." As Carl pouted about not leading the flock, Ralph continued down the line. He was about to check off the last name on his list, when he realized that a goose was missing. At first, no one said a word. But then Betty, who was standing on the other end of the line said, "I know where Winston is." "Do you mind telling me where?" asked Ralph. "Well, I promised him I wouldn’t say anything." "Betty, as I stand here before you, icicles are forming on my beak. Please tell me where Winston is so that we may get underway," pleaded Ralph. "Alright, follow me," said Betty reluctantly. Betty flew off the hilltop and the other geese followed suit. After flying over a waterfall and taking a few turns here and there, the flock landed in an open field. The field was surrounded by large pine trees that lined a long and winding river. "Okay, Betty. 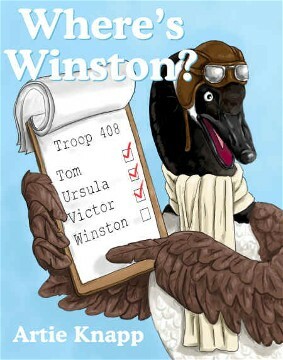 Where’s Winston?" asked Ralph. "It’s not much further," said Betty. Betty led the flock down the riverbank and then up a hill where an old wooded shed lay buried in brush. "Winston, are you in there?" asked Betty. A large noise from within the shed rattled its foundation. "Yes, it’s her, Winston," said Ralph shaking his head. "Why aren’t you packed and ready to go?" Winston stuck his head out of the shed and was surprised to see the entire flock staring at him. "What’s everyone doing here, Betty? I told you not to tell anyone where I was at." "I’m sorry, Winston. But the flock doesn’t want to leave without you." As Winston stepped outside he was carrying something in his arms. It was a little Cardinal who had fallen out of her nest. "Winston, what are you doing?" asked Ralph. "I’m taking care of this little bird. She injured her wing and can’t fly." "I can see that, but you’re not a doctor, Winston." "I know, Ralph. But the entire staff at the Birdville Medical Clinic has already flown south for the winter. They left yesterday. Nobody else is around to help. I can’t just leave her here." "Look, Winston, I sympathize for the little bird. I really do," said Ralph patting the little Cardinal’s head. "But we’ve got to go. We can’t stay here for the winter." "I’m sorry, Ralph. But I won’t leave her. And besides, there’s plenty of food. It just won’t be what I normally eat." As Ralph began to speak he briefly interrupted himself by letting out a loud sneeze. "Alright everyone, as much as I disagree with Winston’s decision, we have to get underway without him," said Ralph rubbing his beak. Ralph could hardly continue as another sneezing fit took hold of him. It had become apparent that due to Ralph’s condition, someone else would have to lead the flock. But that presented a problem in itself. You see, the members of Troop 408 were either past their prime and didn’t want to lead, or they were way too young to take on such a huge responsibility. "Ralph, you’re in no condition to lead the flock. 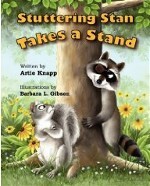 I’ll have to do it," said Carl enthusiastically. The thought of Carl leading the flock pained him, but Ralph knew that there wasn’t anyone else ready to lead. And Ralph’s cold was growing worse by the hour. As Ralph reluctantly announced that Carl would be leading the flock, the members of Troop 408 consoled one another. They shouted at Winston that he should be the one to lead them. But Winston wouldn’t budge. It wasn’t that he looked forward to the long winter ahead; he just knew taking care of his little friend was the right thing to do. The geese then flew out of sight, leaving Winston and the little Cardinal all alone. Winston smiled at the little Cardinal and told her that everything would be fine. But deep down, Winston was feeling very lonely and hurt that nobody had offered to stay with them. The next week felt like a month to Winston, and the week after that felt even longer. But then one day while searching for food by the riverbed, Winston looked up and Troop 408 was heading in his direction. He had never felt so happy. "I knew they would come back," said Winston aloud. "I just knew it." One by one the geese landed by the snow-covered riverbed. "Thank you! Thank you so much for coming back," said Winston. But none of the geese said a word. They were out of breath and visibly upset. Winston soon discovered that the flock had no intention of coming back. You see, when a flock of geese honor a code of silence they follow their leader no matter what. And Carl’s loop around Atlanta cost them dearly, as he led the flock right back where they started from. Two significant things happened that winter: A baby Cardinal grew up to be a healthy bird, and the members of Troop 408 vowed to never honor one of their most sacred pacts again.